Public Art in Parks	The Minneapolis Park System hosts a delightful variety of public art, from the iconic Minneapolis Sculpture Garden and Minneapolis Institute of Art, to dozens of sculptures, fountains and other works that create treasured culture resources across neighborhood and regional parks. Minneapolis Parks and Recreation Centers showcase and celebrate the city’s abundant artistic talent and passion through a series of wonderful annual events. For details on these events, visit our Events page. Winter, Farview Park Dozens of homemade “art sleds” careen down a sledding lane, cheered on by hundreds of spectators. Create a sled of your own or just come out and witness the spectacle! Summer, Father Hennepin Bluff Park Owámni means “falling water” in the Dakota language, making it an apt name for a festival beside the only waterfall on the Mississippi River. This free and family-friendly event celebrates indigenous Minnesota culture with music, art, food, and more. Summer, Loring Park The event features 140 visual artists selling original work, with something for everyone. Visitors will encounter strolling musicians, scheduled stage performances, engaging children’s activities and adventurous culinary options. Summer, Powderhorn Park The Powderhorn Art Fair is a unique collaboration with the Powderhorn Park Neighborhood Association and the Minneapolis Park and Recreation Board. Each year, artists from all over the country share their creativity and artistic creations for all to see. This is a juried art show and held on the same weekend as the Uptown Art Fair, with Metro Transit providing ARTPASS buses to take people between the art fairs. September, Lake Nokomis Park The annual Monarch Festival celebrates the monarch butterfly’s amazing migration from Minnesota to Mexico. Using art, music, dance, games, native plants, prairie tours and food, the festival raises awareness of the need to provide and protect monarch habitat. Ole Bull Artist: Jacob Fjelde Materials: Bronze, Granite Year: 1897 Location: Loring Park Description: Ole Bull, famed Norwegian violinist, made frequent stops to Minneapolis and connected strongly with the Scandinavian community within the city. His traditional romantic style in tandem with his use of Norwegian culture and language helped to support a distinct, modern identity for the Minneapolis-Norwegian community. 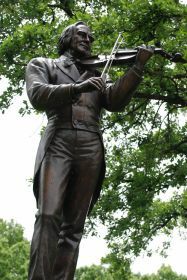 He stands upon a pedestal engraved with a line of music, playing his violin. Spirit of Peace Artist: Caprice Glaser Materials: Bronze Year: 2005 Location: Lyndale Park Peace Garden Description: This series of sculptures illustrates the ancient craft of origami and folding a peace crane. Words of peace are engraved at the central base in 23 different languages. The surrounding walking path includes peace stones, taken from ground zero in Nagasaki and Hiroshima, with plaques illustrating for visitors how to create their own peace crane. The sculpture represents the international tradition and legend that people who fold a thousand paper cranes will be granted a wish. The sculpture also honors Sadako Saski, a young girl who developed cancer as a result of radiation released by the atomic bomb dropped on Hiroshima. She folded over one thousand peace cranes before she died at age 12. 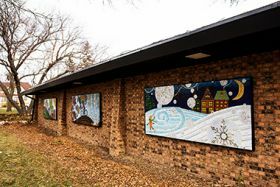 Seasons Mosaics Artist: Sharra Frank and community members Materials: Glass, Grout, Wood, Aluminum Year: 2016 Location: Bryant Square Recreation Center (exterior) Description: This series of mosaic panels on the outside of the recreation center were designed by artist Sharra Frank and assembled by more than 100 adults, seniors and children from the neighborhood. A different Sharra Frank mosaic had been permanently affixed to a building across from the park. The mosaic was destroyed when that building was renovated, so community members came together to install a new series of mosaics on the recreation center. Ethos (Sheridan Veterans Memorial) Artist: Robert Smart Materials: Steel, Concrete, Granite, Bronze Year: 2014 Location: Sheridan Memorial Park Description: From 1995 to 2005, World War II veterans from northeast Minneapolis looked for a site along the Mississippi River to commemorate war veterans. 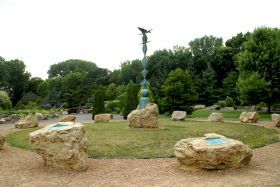 Sheridan Memorial Park became the designated location, which honors all Minnesota veterans. 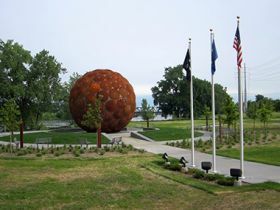 The center sculpture was designed using interconnected “shields” as a metaphor for peace and a defensive symbol of protection. Its spherical shape references the global implications of war. Additionally, there are eleven markers. Ten of them describe conflicts Minnesotan veterans fought in. Each marker is a casting of a local veteran’s (or relative’s) face. Their contemplative facial features allow visitors to reflect on the sadness of loss. The eleventh marker is a child’s face, representing the future and its possibility of war; however, the empty plaque invites visitors to reflect on their own responsibility to work for peace. Phelps Fountain Artist: Charles S. Wells Materials: Bronze, Concrete, Marble Year: 1915 Location: Lyndale Park Description: The fountain’s artist, Charles S. Wells, was born in Glasgow, Scotland in 1972. He came to Minneapolis in 1910 to create carvings for St. Mark’s Episcopal Church and began teaching at the Minneapolis School of Art (now Minneapolis College of Art and Design), but stopped teaching while designing the Phelps Fountain. The fountain was donated by park commissioner Edmund Phelps in 1915. Initially located at the original Gateway Park in downtown Minneapolis, the Park Board decided to move Phelps Fountain to its current home after Gateway Park moved in the early 1960s. Cottontail on the Trail Artist: Jeffery Barber Materials: Bronze Year: 2002 Location: Minnehaha Parkway Trail (Minnehaha Parkway & Portland Avenue) Description: This popular art piece is an 11-foot tall bronze bunny that has become a beloved member of the Hale Page Diamond Lake community, especially for children. 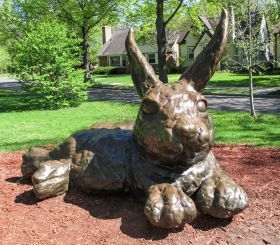 This cottontail rabbit represents the animal life and the whimsy of the neighborhood. Visitors may find the bunny adorned with ribbons, eggs or other seasonal decorations throughout the year. 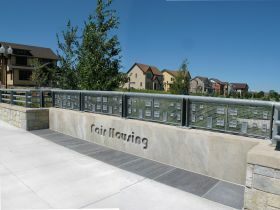 Remembering Rising: Fair Housing Overlook Artist: Seitu Jones Materials: Granite, Steel, Concrete Year: 2011 Location: Sumner Field Park Description: This overlook highlights the history of housing in the Heritage Park area. Seitu Jones left a blank space at the end of the timeline to acknowledge that history will continue to change. The housing imagery in the railing is based on the architecture of the original Sumner Field homes. 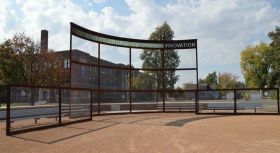 Innovation Field Artist: James Brenner Materials: Steel and Glass Year: 2009 Location: Jackson Square Park Description: The Innovation Field backstop refers to the influences of both Thomas Edison, for whom the nearby high school is named and Louis Rober, who is credited with bringing the sport of softball to Minneapolis. Both this piece and the nearby sculptures by the same artist titled In Flux and Double Flux represent the diverse and dynamic community of the Holland neighborhood. Powderhorn Gateway: Teahouse on Powderhorn Lake Artist: Susan Fiene Materials: steel, iron, concrete, paint Year: 1993 Location: Powderhorn Park Description: This art piece sits on the edge of Powderhorn Lake, inviting people to the waters’ edge. The structure is reminiscent of a teahouse or pavilion providing viewers with a beautiful view of the lake and surrounding hills. The brightly-colored lattice work evokes rays of sunshine. The railing includes depictions of a turtle and fish, while the benches include an elephant and deer. 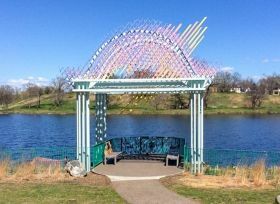 It’s a popular site for both fishing and weddings, and in 2015 the artwork was completely renovated. Much of the public art in Minneapolis parks is the result of robust partnerships. The Minneapolis Institute of Art is built on Morrison Park. The park is named for Dorrilus Morrison, one of the first Minneapolis park commissioners in 1883. Dorilus’s son, Clinton, donated the land to the park board in 1911, under the condition that the land would be designated as the site of an art museum. The Minneapolis Institute of Arts (now known as Mia) opened in 1915. Admission is free. Mia’s permanent collection has grown from 800 works of art to more than 89,000 objects. Mia is also one of the largest arts educators in Minnesota and offers a lot of great arts programming across Minneapolis parks. The museum’s free general admission policy, public programs, classes for children and adults, and award-winning interactive media programs have helped to broaden and deepen this museum’s roots in the communities it serves. Mia owns and maintains all artwork both inside the museum and the collection of pieces outside on Morrison Park grounds. The largest urban sculpture garden in the country, the Minneapolis Sculpture Garden is a joint project of the Minneapolis Park and Recreation Board and the Walker Art Center. In 2016-17, it was fully reconstructed as a more sustainable, accessible space featuring a number of new artworks. MPRB maintains the grounds, while the Walker owns, maintains, and curates all the artwork. This crown jewel of the city’s park system unites two of Minnesota’s most cherished resources—its parks and its cultural life. Since opening in 1988, the Garden has welcomed millions of visitors, showcasing more than 40 works from the Walker Art Center’s collections, including the iconic Spoonbridge and Cherry. It is must-see destination for visitors of all ages. Open 365 days a year, from 6 am to 12 midnight. For more than 30 years, the City of Minneapolis has enriched the lives of citizens and visitors by integrating public art into city planning, services design and infrastructure. The City’s Public Art Program features new commissions through the Art in Public Places program, the conservation and maintenance of the City’s collection of over 60 works located in all parts of Minneapolis, support to other departments and agencies, including the Minneapolis Park and Recreation Board, in developing public facilities, infrastructure, and public art projects, and permits to neighborhoods and community groups for art projects in the public realm. There are more than 60 artworks in the Minneapolis park system, but only half are owned by MPRB, and they are mostly historic works. The rest are owned and maintained by the City of Minneapolis, community organizations, or private entities who sponsor and care for the artwork while it is hosted on public park land. Thanks to the generous support of these partners, dozens of creative and inspiring artworks are available throughout the park system for all visitors to enjoy. If you or your organization are interested, please see the “Sponsoring Art in Minneapolis Parks” tab. Interested in sponsoring the installation of new permanent or temporary public art in a park? 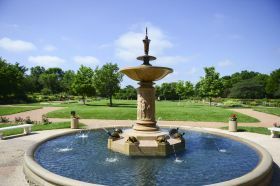 Help keep historic sculptures, fountains and other artworks in Minneapolis parks looking good by volunteering for periodic clean-up and maintenance. You or your organization can “adopt-an-artwork” by donating time and funds to its care and stewardship. For information on available artworks and details on how to get involved, please call 612-230-6469 or email codell@minneapolisparks.org. MPRB generally hosts rather than owns art on public land. Sponsors of art are responsible for funding, fabrication/acquisition, maintenance, and deaccession of the artwork. MPRB staff administer the project implementation. Currently, artwork is rarely funded through MPRB capital projects. Sponsors can be artists, individuals, groups, or organizations. Projects must meet MPRB safety and maintenance standards and may require review by a structural engineer, landscape architect, and/or conservator. Sponsors are required to draft a proposal with budget and maintenance plan, and to enter into a legal licensing and maintenance agreement with MPRB. Sponsors must conduct community engagement on the project prior to its installation on public land. MPRB requests that you work with our Public Art Coordinator on details before conducting engagement. Start planning early. The process for installing new artwork (mural, sculpture, etc.) can take anywhere from 4 months to two years or longer, depending on the complexity of the project. The process can include review of the artwork proposal by MPRB staff, community members, and the MPRB Planning Committee and full Board of Commissioners. Memorials on public parkland are managed by the MPRB Customer Service department. Submit a request form online: Memorial Request Form or call 612-313-7743 for more information.